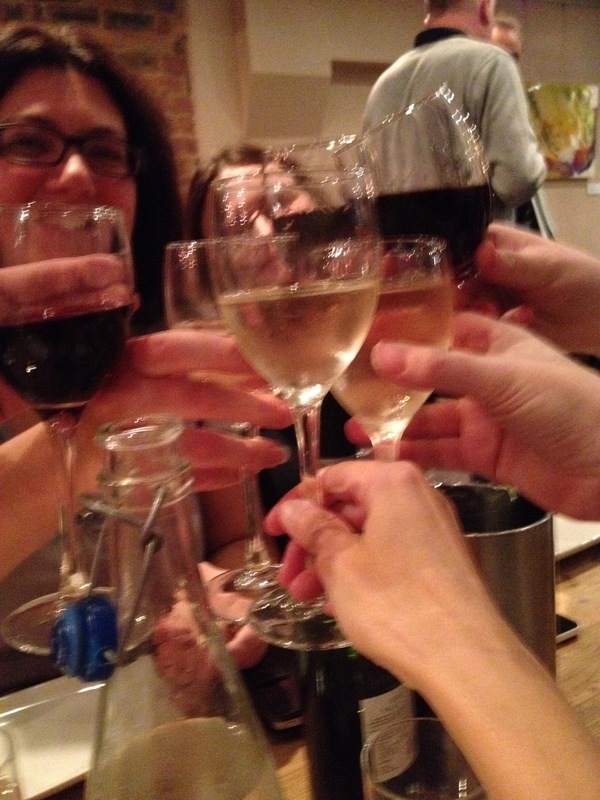 Life Cycle Of A Writer – Third Round-Up of 2015! Catherine: Signing my first contract with Carina UK and discovering what it is to be a real author. I’ve had my first set of revisions and lots of plans are afoot for 2016 when my new title and front cover will be revealed. And getting the second book ready so it’ll be available for pre-order by the time book one is out! 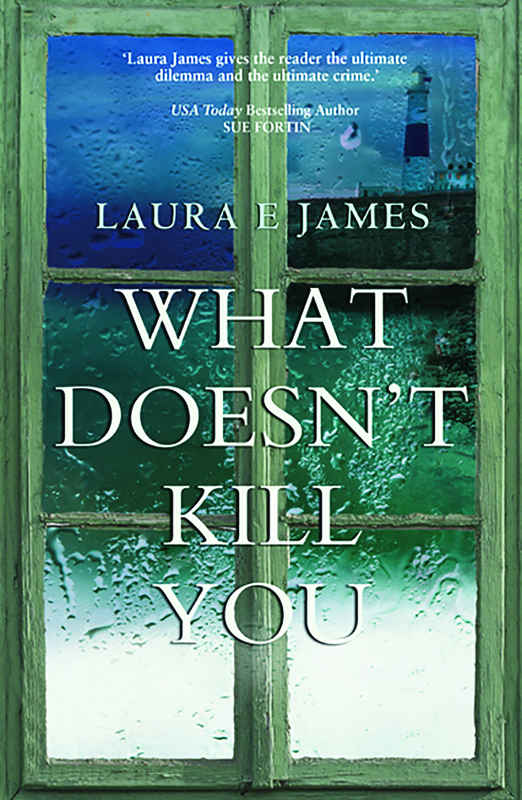 Laura: I’ve had a bit of everything going on – school holidays, a DD with her leg in plaster, and edits for book 3. I have a few events coming up, about which I am excited, but more on those nearer the times. 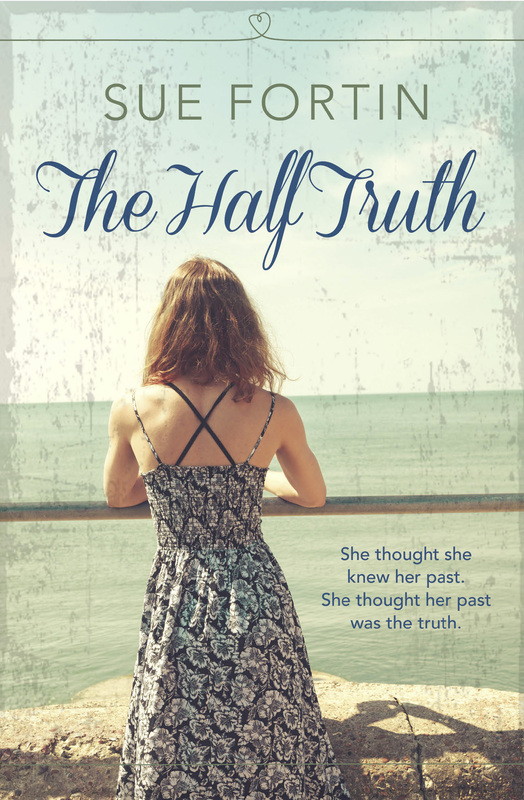 Celia: Drank lots of wine, wrote like a mad woman all summer and notched up 60,000 brand new words for my WIP – a psychological coming-of-age story. Now back at work and have been The Boss for a while so no writing progress made; the next big push is to finish, edit and submit. Also limbering up for Tirgearr edits on the new one due out in January – Moondancing; a prequel to Little Boxes. Lastly, made the short list for the Exeter Story Prize. Final prize giving on October 17th so off on a jolly to Exeter with everything crossed. Vanessa: School holidays have meant less writing time, but I’m deep into a new draft of my work-in-progress now, which will hopefully be ready to send to my agent in the next few weeks. I also had a lovely phone call to say I’ve made the Wells Literary Festival short story competition shortlist! Sue: I’ve been a busy bee finishing my work-in-progress which took a bit longer than I had hoped but is now out and under consideration. I’ve also been working on a novella which I’ll be self-publishing with the Romaniac Press. I’m looking forward to sharing the cover and blurb here very soon. Debbie: It’s been four long years and four re-writes but having finally managed to write, ‘THE END,’ I’ve taken to eagerly stalking the postman each day as I wait for my work-in-progress to arrive back from the RNA NWS. In the meantime (and in an attempt to distract myself) I’m working on the first chapter of the next novel. Jan: EDITS! EDITS! EDITS! Working through her edits for As Weekends Go, the winner of Choc Lit’s Search For A Star competition, ready for publication. She’s now recovering. All that in EIGHT WEEKS. I think it calls for another refill of the cake tin at Romaniac HQ. Here at Romaniac HQ, we believe in positivity. The reason we started the Life Cycle Of A Writer posts was so that we can share the lows and highs of our journeys. It is a mighty tough business for which you need a thick skin, but we go by the philosophy if you work hard and believe in yourself great things will happen. Give yourself the chance to sparkle, and if you don’t mind indulging us for a few minutes, we wanted to share our moments of triumph with you and together raise a glass to all the highs. If that wasn’t enough reason to raise a glass, during our sparkle weekend Catherine Miller learned she’d won the Just Write Monthly Masterpiece competition for Miles Between Us. With the judges saying they were gripped from the very start. The first three chapters are now available to read on their website. 2015 got off to a great start when Vanessa received news she’d won a Writers Forum competition for her short story No Such Thing As Monsters. The magazine should be out in March! To add to our early 2015 cheer, Catherine was highly commended runner-up in the Accent Press and Woman magazine writing competition for her work-in-progress Baby Number Two. Laura E. James carried out her first Waterstones book signing at the Dorchester branch, selling and signing copies of Follow Me Follow You. 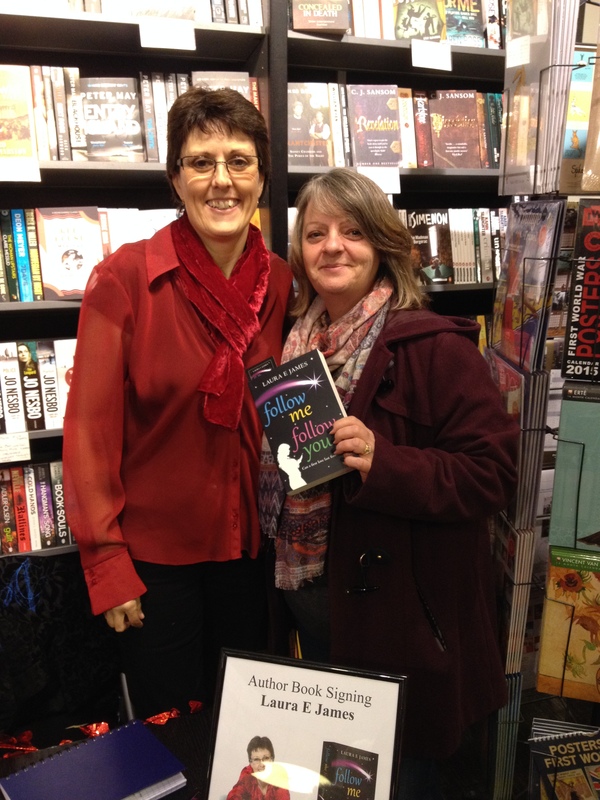 Laura and Sharon Goodwin (Jera’s Jamboree) at Dorchester’s Waterstones. 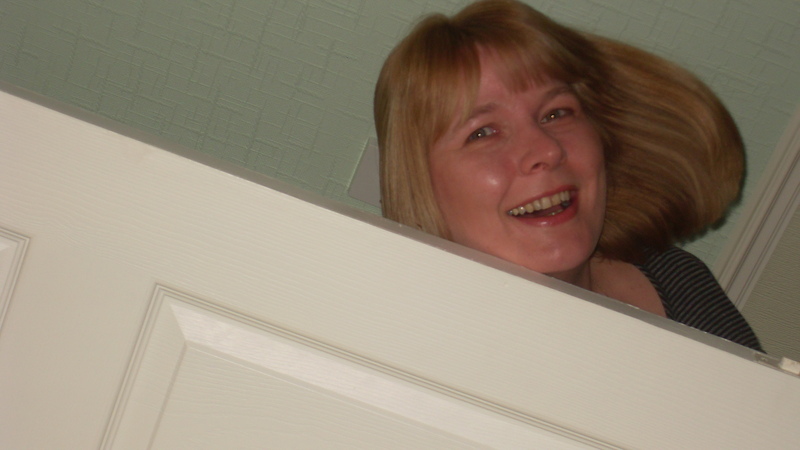 Vanessa received double good news in February – Her current work-in-progress The Murder House made the final four in the Caledonia Novel Award and she came third in the Flash500 flash fiction competition with her story Pretty Maids All In A Row. March has been mega for good news, and we’re only part way through the month. Catherine went up to London to receive the Katie Fforde bursary award. This is for someone on the Romantic Novelists’ Association’s New Writers’ Scheme who has great potential. 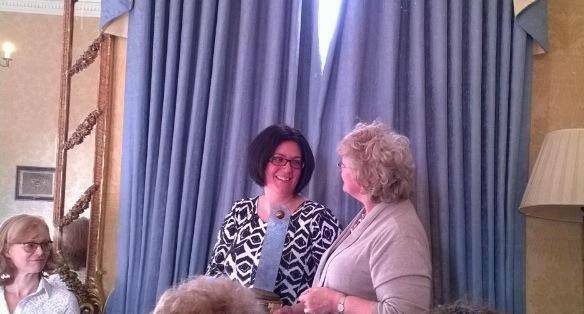 Katie presented Catherine with a trophy at the RNA March meeting. Laura carried out her first talk with a fellow Dorset writer, Kathy Sharp. The Preston Friendship Club were fantastic audience, and Laura hopes to do similar events in the future. In a celebration of Mother’s Day, Celia J Anderson’s letter to her mother was included in The Guardian. It’s the first letter and has a lovely picture of Celia in a bonnet. 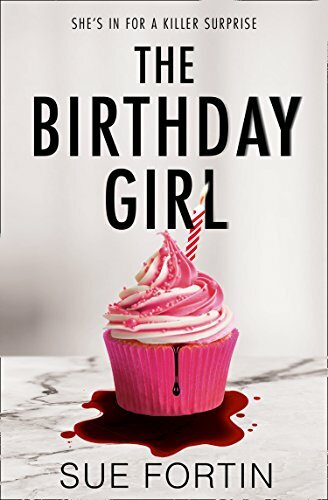 As if all these bits of excitement weren’t enough, Romaniac HQ celebrations went into overdrive when we learned our wonderful Jan Brigden won the Choc Lit and Whole Audiobooks Search for a Star competition. Her novel As Weekends Go will be published later this year. We’re absolutely delighted for Jan and so glad to have our first life cycle transition from aspiring to published writer. We’ve also finished putting a considerable number of words together with The Murder House by Vanessa Savage, Baby Number Two by Catherine Miller, Fractured Love by Lucie Wheeler, What Doesn’t Kill You by Laura E.James and Living The Dream by Celia J. Anderson reaching completion in one stage or another and the very hard-working Sue Fortin has been getting The Half-Truth into its final version ready for publication in two days time! Time to upgrade Romaniac HQ’s mini-bar. There’s no way we can stock enough champagne in there if the good news keeps coming in at this rate. Now if you’ve all got a filled glass, please raise it to the wonder of sparkle and positivity!